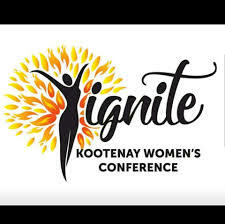 The first annual Ignite Kootenay Women’s Conference was a resounding success. Over 160 women from across the Kootenays attended the two-day event. Among other things, we learned about money personalities, the Grief Ring Theory, how to better deal with anxiety and guilt, the importance of mindset, and how gratitude can literally change your life. Not only did we receive nourishment for our souls, but Trackside Bistro and Kootenay Catering provided us with delicious food, while The Old Theatre kept the coffee and lattes flowing. Two major goals from the conference were to give a donation to Chrissy’s Place Women’s Centre, and set up an Ignite Kootenay Women Scholarship with Stanley Humphries Secondary School. This past Friday, a $500 cheque was given to Kristen Johnson, Director of Castlegar and District Community Services Society. This money will go toward funding programs and initiatives at Chrissy’s Place. In addition, next month a $500 scholarship will be set up with the high school. As the organizer of this conference, I would like to express my gratitude and appreciation to all the speakers, volunteers and other “crew” members who made this event possible. Each of you helped make my dream a reality. And to the dozens of businesses, organizations and individuals who donated money, products, or services - your generosity is a beautiful thing. Thank you all! Planning is already underway for next year’s event, so if you loved what you experienced last weekend, or if you weren’t able to attend, mark your calendars for March 2020.